We share full details of eLife's costs with the hope that, by being transparent, it will help to set a future course for research communication that is efficient and sustainable. Every year since 2012, eLife has published an annual report on activities along with our US Form 990 (required for our type of non-profit organisation) and our audited financial accounts. This year, we present a deeper view of our 2015 financials, covering publishing and non-publishing expenses. As part of our ambition to change how science publishing works, especially among highly selective journals, we hope that being transparent about our costs will help to set a future course for research communication that is efficient and sustainable. eLife has a broad mission to help accelerate discovery by encouraging and recognising responsible behaviours in science. We are a unique operation, not designed specifically to be a financial model for open-access publishing, but to catalyse change in science publishing by making significant investments in new approaches. One of our goals, for example, has been to improve the quality and efficiency of peer review for research that shows the greatest promise, and we pay the active researchers who are involved in these efforts as eLife’s editors. We feel it is important to offer remuneration to the editors, to compensate at least in part for the hard work that these busy scientists provide to devise, optimise and run a new editorial process. As a result, eLife authors and referees benefit from a collegial process that provides clear, high-quality decisions and limited rounds of revision. We also hope that the lessons we learn will lead to the broader adoption of these practices. This is just one example of an investment eLife makes to try and inspire change and fulfill our mission; another is our investment in technology innovation, discussed in more detail below. We believe it is helpful to provide information about these expenses as well as the more typical publishing costs at eLife, so that all of the parties who have a stake in research communication can have a more informed discussion about the costs and benefits that are associated with different approaches to publishing. 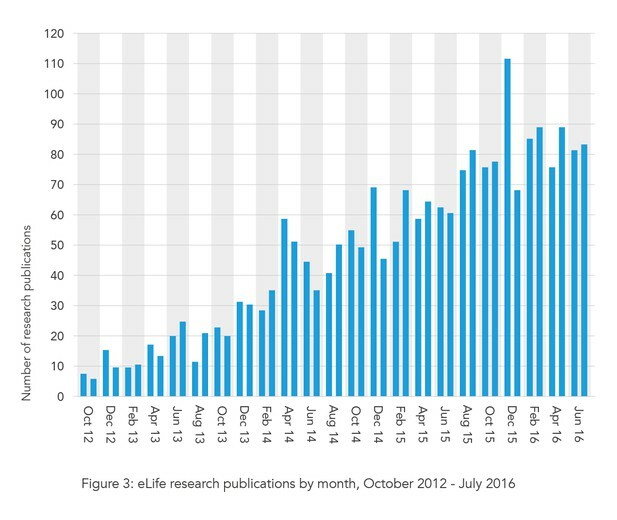 Since our launch in 2012, we have steadily increased our staffing and investment in product and technology development – building on the success of the eLife journal to pursue our much broader ambitions. 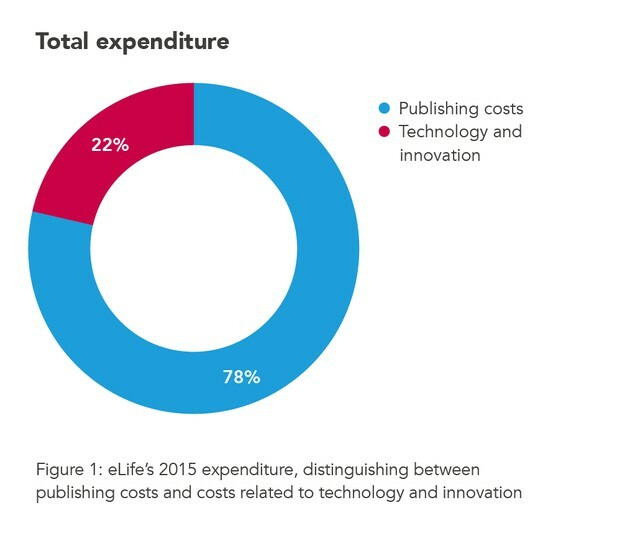 In our 2015 annual report, we have therefore, for the first time, split out our costs in terms of publishing and non-publishing activities (Technology and Innovation), defined as follows. In 2015, 22% of our £3.9m total expenditure (£831,000) was invested in technology and innovation and independent of our publishing operation (Figure 1). Within the technology and innovation budget, we invest in software development, new product design, collaboration and outreach. In 2015, for example, we contributed financially to the creation of the Lens Writer by Substance.io and the first phase of eLife Continuum, the open-source continuous publication platform put in place to host the eLife journal earlier this year. We also invested heavily in new designs that will be incorporated into the eLife website later this year. This work involves in-house and third-party resources and we anticipate that our investment in technology and innovation will continue at least at its current level for the foreseeable future. The balance of our expenditure last year was used to manage 6,024 new submissions, to publish 833 research papers plus related content, and to promote eLife and its content (Figure 2, Table 1). 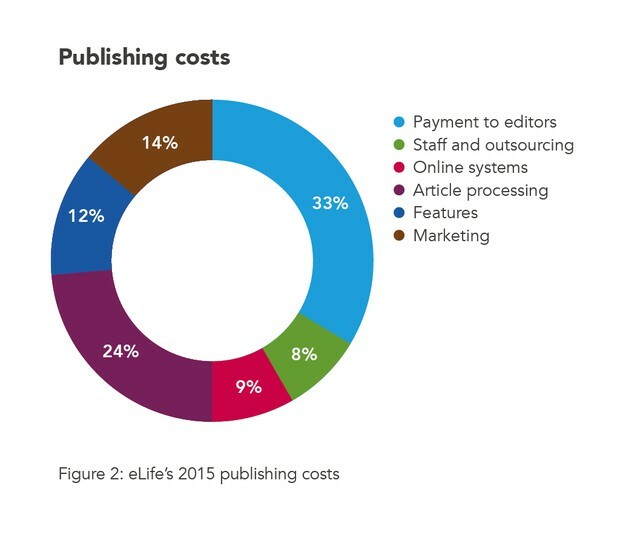 Differentiating the publishing and non-publishing costs allows us to explore the costs per published article at eLife. A key driver of the cost per article each year is the number of articles published. For a new journal, such as eLife, this cost will continue to decrease as the volume continues to go up. Figure 3 shows our rate of growth since eLife first started publishing in October 2012. In 2012, we published 27 research articles and our overall costs were £2.25m. 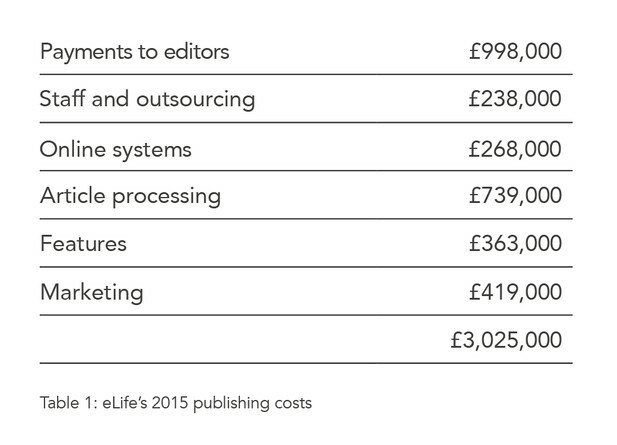 With a crude calculation, we might deduce that the cost to publish one research article in eLife in 2012 was £83,333. However, this fails to account for start-up costs, including establishing our first editorial and publishing systems, which are major undertakings. Table 2 shows our publishing-only costs and average annual cost per article for the past three years, and the estimated costs for 2016. Given the continued (albeit more modest) growth this year, we anticipate that the cost per article will drop further in 2016 and in subsequent years. It is worth noting that our publishing costs increased by very little in 2015, despite a substantial increase in publishing volume. This is because of a major shift in focus of the work of our technology team. Through to the end of 2014, their work was mainly dedicated to implementing and incrementally improving routine systems. In 2015, however, their focus shifted towards new initiatives and specifically to the development of eLife Continuum, the continuous publication platform we launched in February 2016. Finally, it is also important to emphasise that, as eLife continues to grow, we will remain committed to publishing excellent science. We don’t artificially limit the number of articles we publish or have a set acceptance rate. Rather, we rely on the judgment of the working scientists who serve as our editors to put papers forward for peer review and publication. While eLife was established to operate without some of the constraints typical publishers must manage, we hope that sharing information about the financial and other aspects of eLife will be valuable to publishers, funders, institutions, authors and others. As the practices of journal publishing and research communication change, we also hope to encourage greater openness and consideration of the costs and benefits of publishing in general, so that we can move towards a system that serves science as efficiently and as cost-effectively as possible. The eLife Sciences 2015 Annual Report is available at https://2015.eLifesciences.org. Reports on prior years are available at https://elifesciences.org/annual-reports.